To hear the words in this book read by a native speaker, choose a page number then click on the arrow buttons. For links to the recommended websites for this book, click on a topic below. To find links to more language activities and resources, click on / English word books / in the menu above. An exciting picture word book for beginner readers and English language learners, full of busy, colourful scenes with lots to spot and talk about. Featuring much-loved illustrations by Stephen Cartwright and the iconic Little Yellow Duck to spot on every double page. 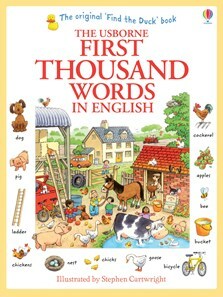 A special edition of this classic word book, revised and updated for the 40th anniversary of Usborne Publishing in 2013. Three generations of children have built their basic vocabulary with this entertaining and fun book. With internet links to listen to all the words at the Usborne Quicklinks Website. I ordered the first book for my Spanish neighbours 8 yr old girl who along with her parents thought it was so good to use alongside the English she is being taught at school. Consequently have ordered the second book for 10 yr old girl who again is using it to help with her English lessons at school. Both sets of parents are so pleased with the layout, the content and the ease with which their children can associate the pictures with the words in English. Needless to say, I have The First Thousand Words in Spanish to help me learn the language. Wonderful - even for children for whom English is a first language. It will expand their vocabulary in a fun and easy way without them even realising it. The pictures are so fascinating that you can look at them time and time again and always spot something new. My daughter loves hunting in the picture for the objects shown around the page, e.g. the ball or the cat. She also sometimes just sits quietly and points at objects she knows and then tries to say the word. Great for a 5 minute quiet time cuddle.